As researchers, it is sometimes easy to become engrossed in the mechanics of the research process – fretting over sample size, quality control, response bias and other technicalities. Admittedly, there are moments when we fail to really “see” the actual people our research strives to help. My colleague Jeffrey Edmeades and I were reminded of this while in Ethiopia’s Amhara region for a project working to improve the lives and future opportunities for child brides in the region. Called TESFA, which means “hope” in Amharic, the project was implemented by CARE Ethiopia, evaluated by the International Center for Research on Women (ICRW) and funded by the Nike Foundation. TESFA gave young, married, extremely marginalized girls unprecedented opportunities to learn about their health, to interact with their peers, and to participate in the social, economic and political life of their families and communities. Most of the more than 5,000 girls we worked with over the three-year project had similar stories: Married off by their parents at nine, 14, 16, to much older men – strangers, really. Forced to drop out of school. Frightening, unwanted first sexual encounters. Because of the remarkable similarity in their experiences, it was at times easy to fall into viewing these girls – our “research subjects”– as a large, homogenous group. Our experience in Ethiopia reminded us how critical it is not to have such a lens, but rather, to see participants as the individuals they are. We found that giving greater prominence to the individual experiences of program beneficiaries – in their own voices – illuminated our research and evaluation processes. Specifically, during the final year of TESFA, we implemented the Photovoice strategy, which gives marginalized communities an opportunity to represent themselves through photography, as an element of program evaluation. It can also serve as a tool for advocacy and policy change. If adapted into a program, it can also become part of the intervention itself, where participants can gain confidence and communication skills to speak up about their lives. 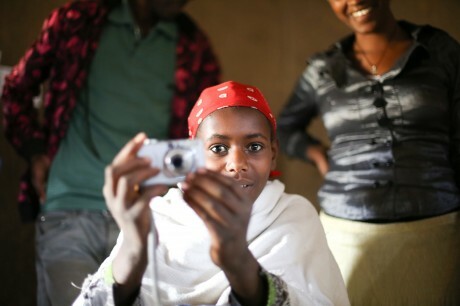 We trained ten girls in the mechanics and ethics of photography, and for five days in April 2013, they used donated digital cameras to document their days and the impact the program had on their lives. Their images are beautiful and revealing. Accompanied by the girls’ descriptions, the photos helped us see the aspects of the program that they most valued. Our research findings support much of what Photovoice revealed. Among them: Young wives reported much more communication with their husbands. Girls’ management of household finances improved and couples experienced greater financial security. Girls’ knowledge about their sexual and reproductive health increased significantly. And they were using contraceptives at a higher rate than before they became involved in TESFA. Using participatory research methods like Photovoice to complement traditional approaches can lead to a richer understanding of programs’ outcomes. For beneficiaries like the child brides we worked with in Ethiopia – and other often overlooked groups – it can provide an unprecedented opportunity to build confidence and skills. And, to really be seen. Robin Hayes is an Independent research consultant and Social Justice photographer who was part of the TESFA research team at ICRW. Jeffrey Edmeades also contributed to this blog. Edmeades is a senior social demographer who directed ICRW’s evaluation of the TESFA project.